22 Michaels: Shoes of Prey is live! 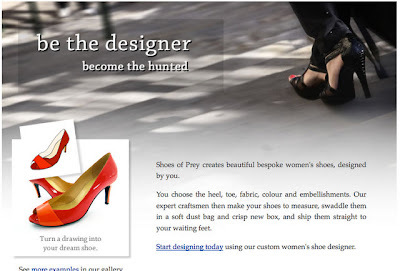 Great news, this morning we resolved our trademark issues (I'll post the full details about that and the winner of our naming competition shortly) and www.ShoesofPrey.com is now live! We'd love your feedback on the site as we'll be doing lots of tweaking over the coming weeks (feel free to go nuts with the little feedback button on the site). Thanks again to you all for helping us get us to this point, we're very excited. Love it Foxy! Looks fantastic! Look forward to seeing you guys again soon and catching up. Site looks neat! Hopefully you'll be able to ship to India? Prices might be steep by Indian standards though! Great stuff guys! lets hope the orders come in! Hey you guys just checked out Shoes of Prey and its awesome! Freakin' awesome work guys - well done. Hope it goes gangbuseters! Also, maybe have an area where the customers can submit their shoe design and people can vote on them. popular ones can be sold cheaper or used in competitions. just kind of thinking aloud.. Thanks everyone, it's great to have finally launched! Jessie - yeh, we can't ship to India yet, hopefully soon, tho yes, as you point out the shoes are priced at the higher end of the market - they are all leather and handmade. Do you think there's still a market in India that would buy the shoes tho? My guess is yes.